Madrid, Spain : I snuck in on this one. For all the years I have lived in Europe I have never been to Spain – too busy travelling in France over and over and over again. But this time I had the opportunity to follow the boyfriend on a business trip so I kinda snuck in on this one … heheh. I was not expecting much as I knew he would be busy attending sessions at the convention centre and I would probably spend a lot of time on my own but I was fine with that. 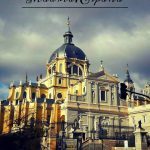 Exploring a city like Madrid is easy as they have a very good metro network.